SPACES FOR CHANGE [S4C] has kicked off the first edition of the slum youth talent hunt show, ‘IFESOWAPO’ in Lagos. The talent hunt commenced on February 13, 2017, with a needs assessment exercise in Ajeromi Community in Badia-East in Lagos, with the aim of identifying what the youth of the community see as their priorities, skill gaps and capacity needs. This exercise is a precursor to S4C’s IFESOWAPO research project, designed to empower and equip slum youth with new skills in local research, media production, storytelling, leadership development, and human rights, through building on their creativity and knowledge of their own communities. The Ifesowapo project presents an opportunity for SPACES FOR CHANGE to explore a different framework for doing research that connects more explicitly with the organizational objective of supporting marginalized communities in becoming actors of social change by having community members actually engaged in and designing the research processes. For too long, an insidious dominant narrative depicting the urban poor, especially the youth living in urban slums and informal settlements as ‘criminal’, ‘deviant’, and ‘delinquent’ has persisted in Nigeria. State authorities have used these popular narratives as justification to evict and displace poor communities, and hand over their land to rich property developers. SPACES FOR CHANGE is determined to change that. Ifesowapo’s main strategy is to merge the use of trans-media tools and programs with a participatory action research approach to challenge and shift this narrative while creating a space for systemic inquiry and amplification of local knowledge. 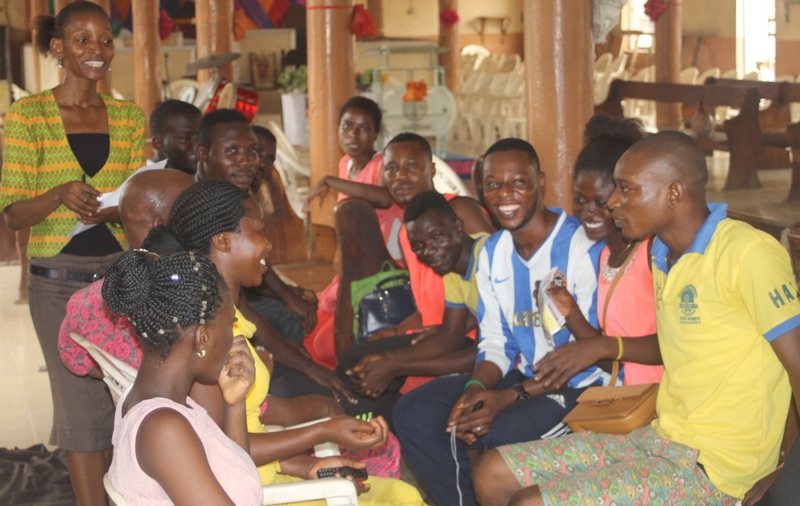 23 young persons who participated in the assessment exercise brimmed with excitement in anticipation of the opportunity to acquire new skills which will help them contribute, not only to their community’s development, but also to their collective struggles for social justice and urban inclusion. They completed questionnaires specifying their skill gaps, and undertook various group activities to showcase existing talents among them. They also took part in simulations about future project activities represented by various media, such as drawings, photography, filming, blogging, graphic design and digital crowdsourcing. The assessment revealed robust youth interest in acquiring media production skills like photography, voice recording, video coverage, photo editing, graphic designs and computer literacy including repairs, programs (word processing, CORELDRAW, and music production) etc. Bolstering S4C’s preparation for the IFESOWAPO project is the addition of Mr. Okezie Njoku in its employ. Mr. Njoku serves as the organization’s Information Technology Officer and Graphics Designer. Working together with Aizighode Obinyan, the Advocacy and Administrative Associate, they will oversee the skills development operations under the IFESOWAPO project. Not only that, SPACES FOR CHANGE has equipped a 6-seater digital studio which will provide both a technology-equipped space and instructor-led support to target groups. Media projects developed under this project will be tailored to suit local needs and priorities, exploring social, legal, political, economic, developmental remedies to problems underlying access to land and violence in targeted slums.